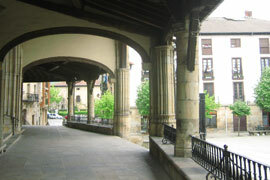 The magnificent Old Town of Elorrio is considered Listed Monument. The streets house beautiful palaces and ancestral homes made of ashlar stone. Most of them date back to the 17th and 18th century and have marvellous coats of arms that refer to the lineage of their owners. Many spots are worth a visit such as Casa-Jara and Marqués de Tola Baroque Palaces, Arezpakotxaga Palace, Don Tello Gate -the only standing access out of the seven gates of the former walls- and the Monastery of Santa Ana -with San Valentín's statue and museum-, as well as several crosses of the 16th century. The Town Hall and the basilica of Inmaculada Concepción are located in the centre of the Old Town, in Gernikako Arbola Square. On the Town Hall's facade we will notice two outstanding coats of arms with biblical quotations in big print. The basilica, on the opposite side, is a Gothic building with Renaissance elements whose construction works finished in the 16th century.